Battery life to keep my toys and phone alive is the biggest challenge. GPS, camera, GoPro, phone. Choose one to charge from the solar panel battery… with this post, I’ll be caught up. On the morning, the misting had stopped but the tents were damp. No fires allowed due to fire danger so breakfast was my remaining trail mix. We rode 7-10 miles along the shore north of Monterey. Sand dunes (in Sand City, naturally) and a porpoise pod body surfing the beach break, that was cool. Breakfast was in Marina, $6.50 for two eggs, sausage and bacon plus a choice of French toast or pancakes. Next door, a bargain grocery store. Giant Hershey bars for $.99. I mean giant. We stocked up. 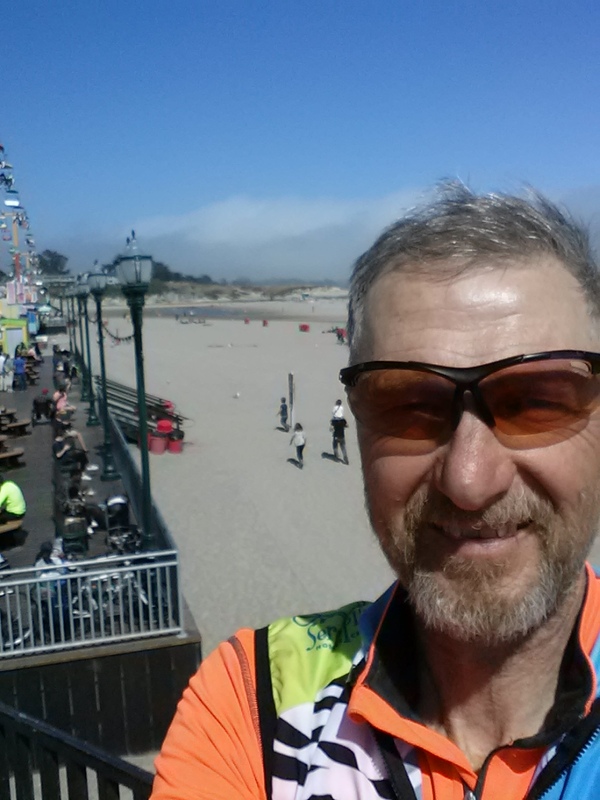 We were headed for Santa Cruz today, the route took us through Watsonville and Aptos. You wouldn’t know these cities but if you could check your produce labels, they might list them as the origin. 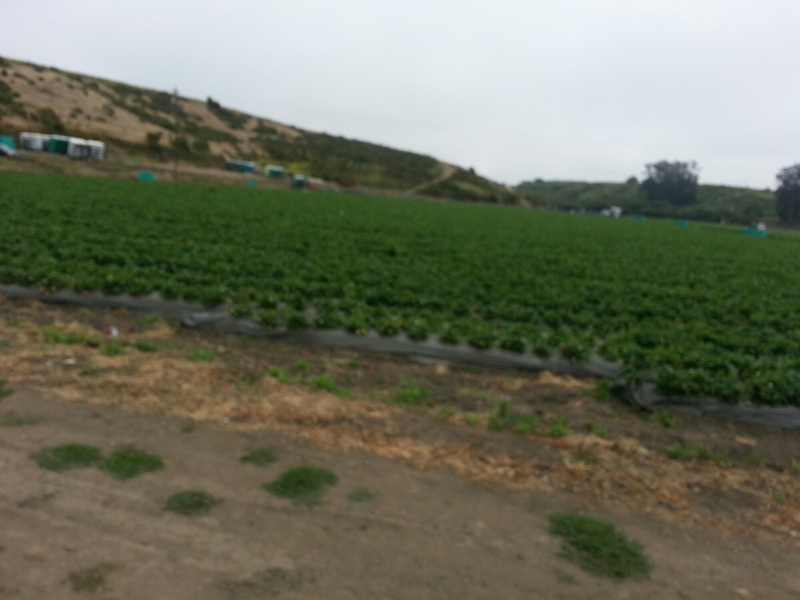 Big Del Monte and Dole packing plants and fields upon fields of strawberries, artichokes, cabbage, unrecognizable leafy greens and even fungus. There were buses parked by the fields and workers hunched over, picking the crops. We stopped at the Santa Cruz boardwalk, billed as “The World’s #1 Seaside Amusement Park”. It had rides, junk food, carnival games and a very nice, soft, fine sand beach. Here is a bonus selfie to show my facial hair growth. I probably scare small children. Our campground, for the second day in a row, required a 500 foot climb. Nice park, they put the bike/hike site next to the campground hosts, so they can keep an eye on suspicious bikers… Warm showers, $.25 for two minutes. I only needed one quarter. Another roughly 50 mile day. Tomorrow we will be within striking distance of San Francisco. Plans are being made to stay with hosts across the Golden Gate Bridge in Sausalito. The hosts warned of a 500 foot climb with a short section of 18% grade. A pattern is unfolding. OotD: If you feel you don’t fit in, come to California, problem solved.